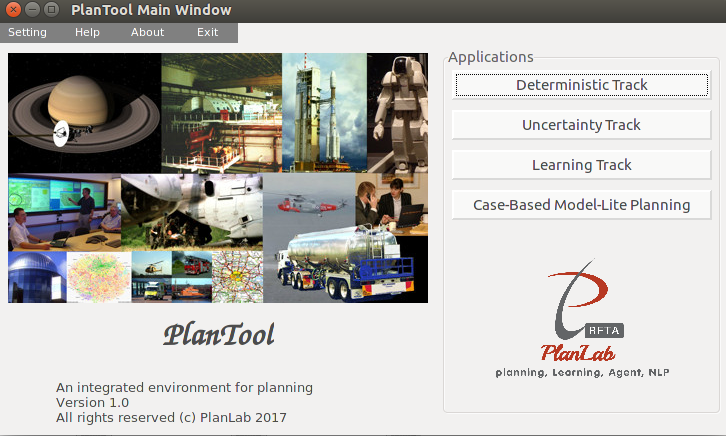 PlanTool is a tool for efficient application and research in planning area, which integrating various popular planners. For now there are a GUI for planning application and a planning package with a lot of planners. ./planner or double/click the icon named "planner"
-choose the corresponding planner in the GUI window for planning. -set the corresponding parameters of the planner, choose domain file and problem file. Then push Run Button to execute planning, the planning result will be given in the right text panel or output to specific file defined in "Output File Name" .